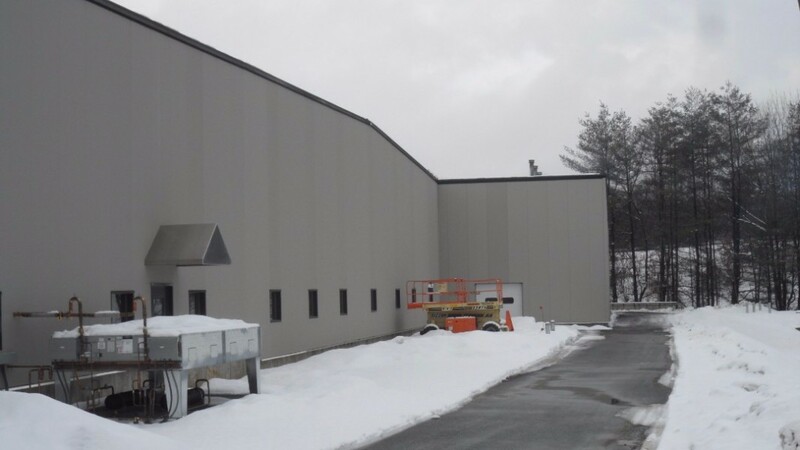 Whelen Engineering now heats most of their 330,000 square foot campus in Charlestown, New Hampshire with Froling Energy’s PDCs—our screened semi-dry wood chips. Whelen Engineering produces a wide range of popular high-intensity emergency lighting devices for police cars, emergency vehicles, airports and race tracks. 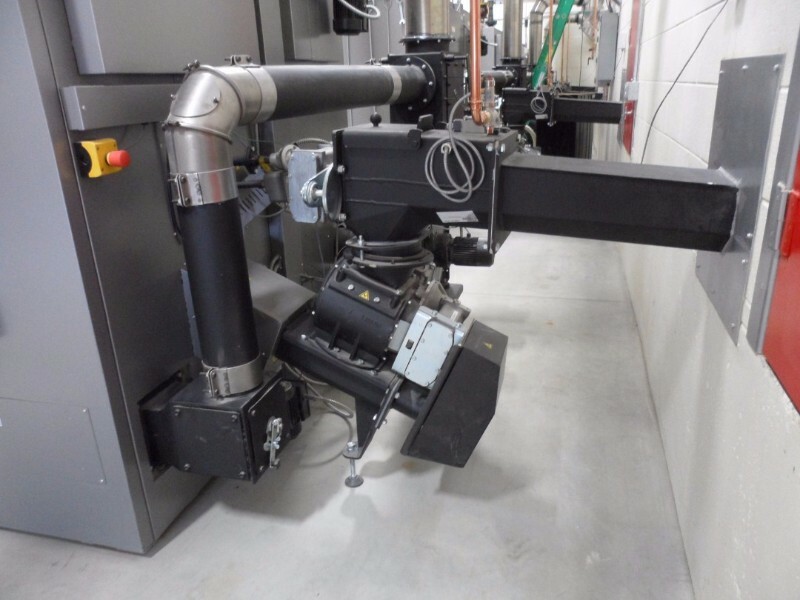 Two virtually identical boiler rooms were built in 2013 and 2014, each housing four Froling ½ million BTU/hr boilers with a pellet storage bin directly behind each one. 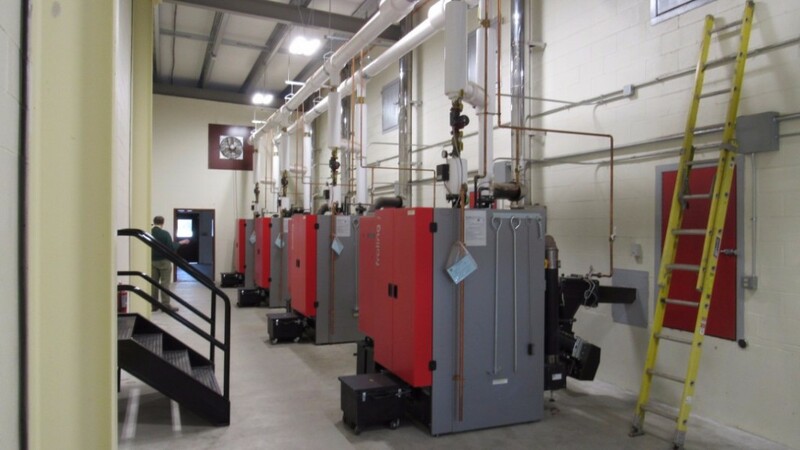 These photogenic boiler rooms provide lots of space for boiler maintenance and adjustments. Froling Energy crews connected hundreds of feet of heat pipes that ultimately tied all of their boiler rooms together and replaced numerous oil-fired boilers and a large oil storage tank “farm”. In 2016 a third, larger, boiler room was added in another corner of the campus. 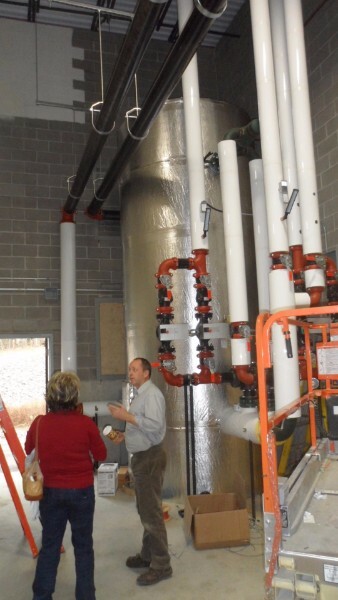 We expect these two boiler systems to generate 2450 NH T-RECs per year. 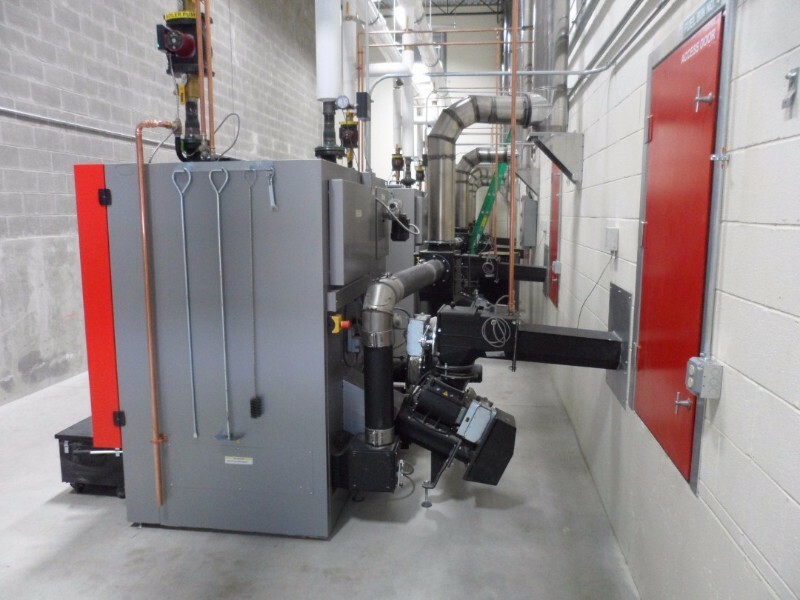 Whelen Engineering Building 1 is the site of their first biomass boiler system. 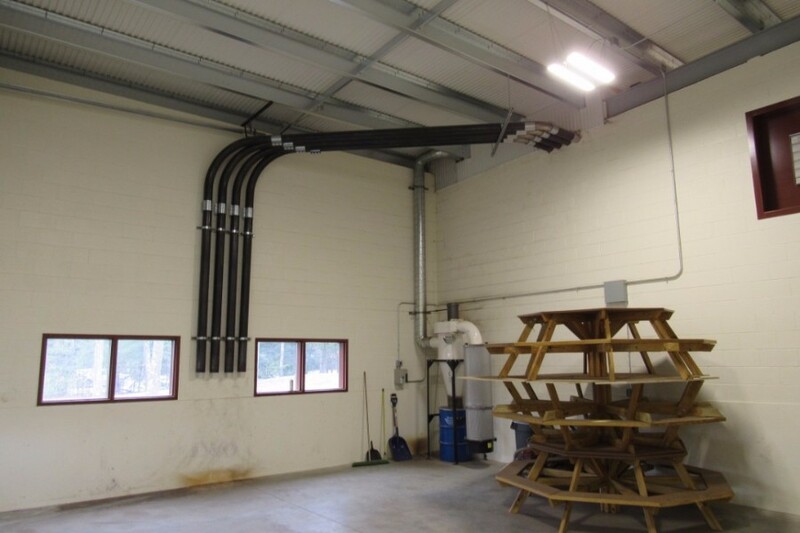 The biomass boiler room was added on as the new Building 1 was being constructed in 2014. 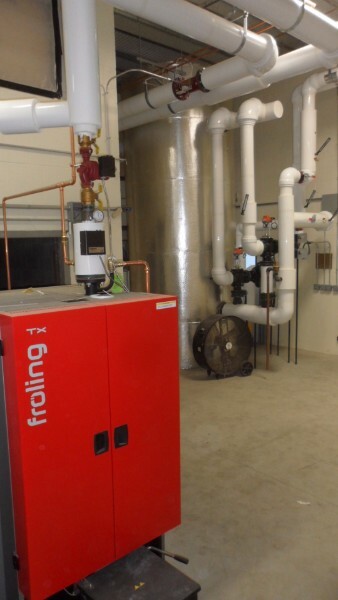 Four Fröling TX boilers were installed in the new boiler room, each with a net output of 1/2 million BTUs per hour. Directly behind each boiler is a chip storage bin that can hold over 30 tons of PDCs. 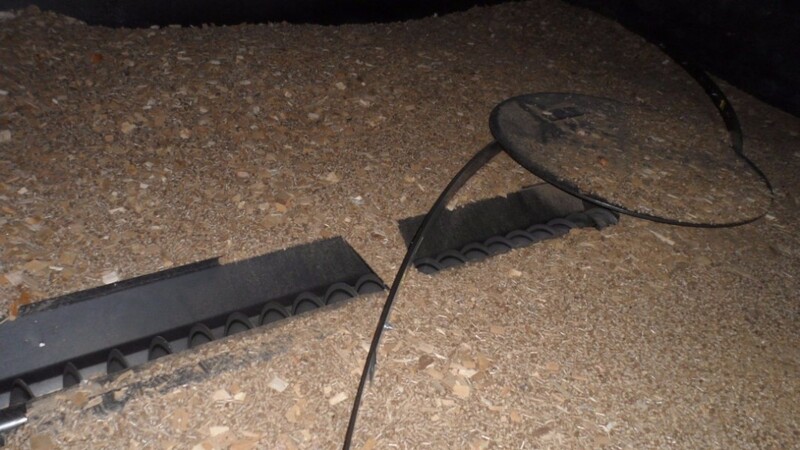 Wood chips are augered in from the bin, through a rotary valve that prevents burn-backs from happening. 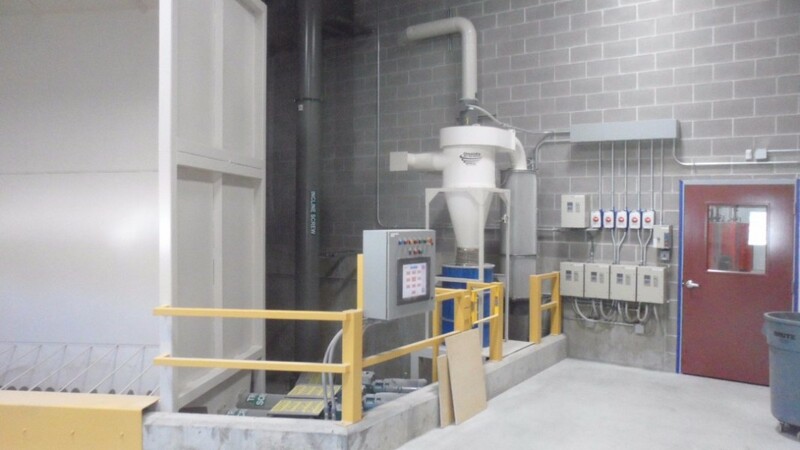 A rotary sweep extraction system pushes PDCs into an auger channel that feeds each boiler. 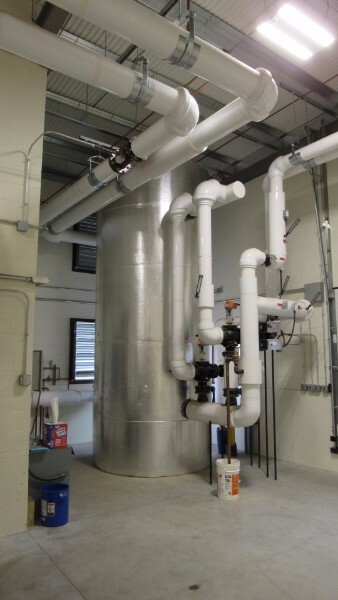 Buffer tanks hold 4000 gallons of 180+ degrees F hot water. 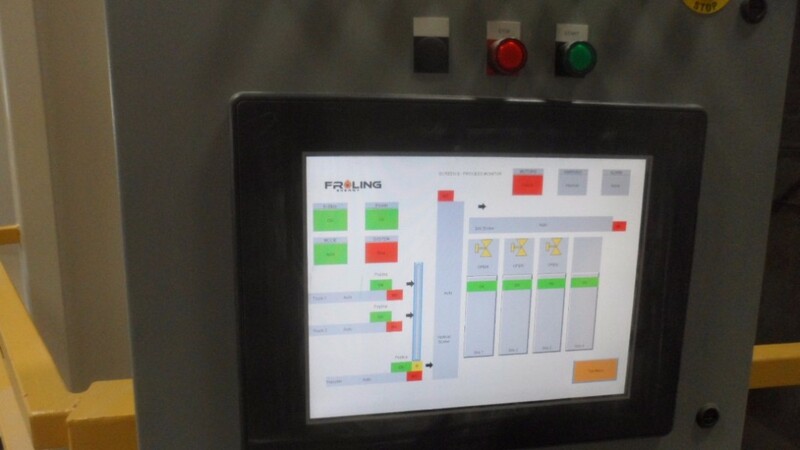 Dozens of data points from the Whelen 1 and 2 boiler systems appear in Froling Energy's central monitoring console, viewed in real time or in historical graphs. 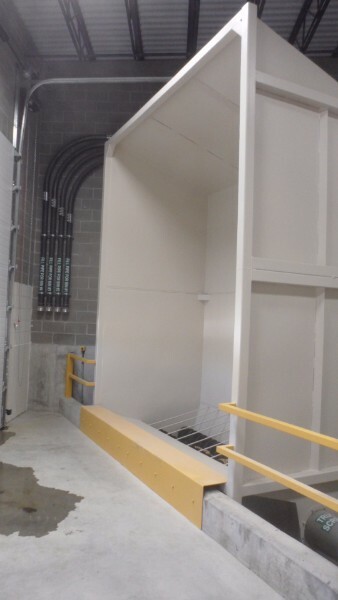 PDCs are blown into the bins through the four 5" diameter pipes at the left but Whelen 1 can also have chips delivered into the receiving bin from a live-floor truck. 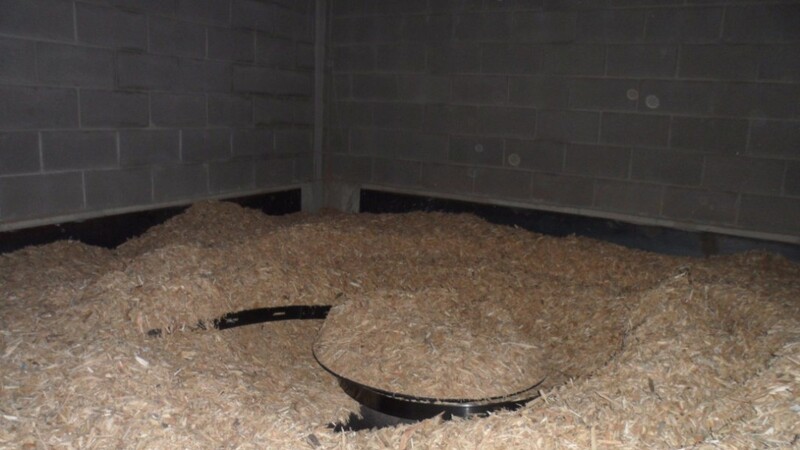 The on-site blower is fed chips from the receiving bin which then immediately delivers them into the storage bins. The custom control panel manages how a new delivery of chips is divided up among the four bins. 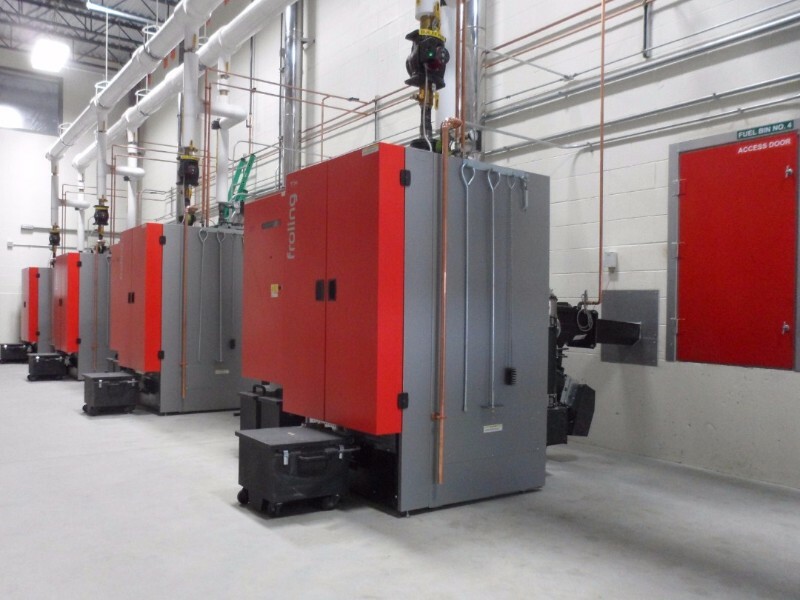 The first Whelen Engineering building on their campus is the site of their second biomass boiler system. 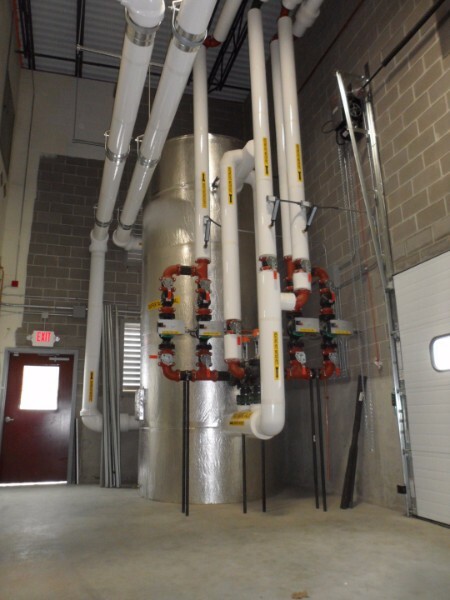 The second boiler room at Whelen Engineering is virtually identical to the first. The buffer tank also sits around the corner from the boilers. Whelen 2's 4000 gallon buffer tank. 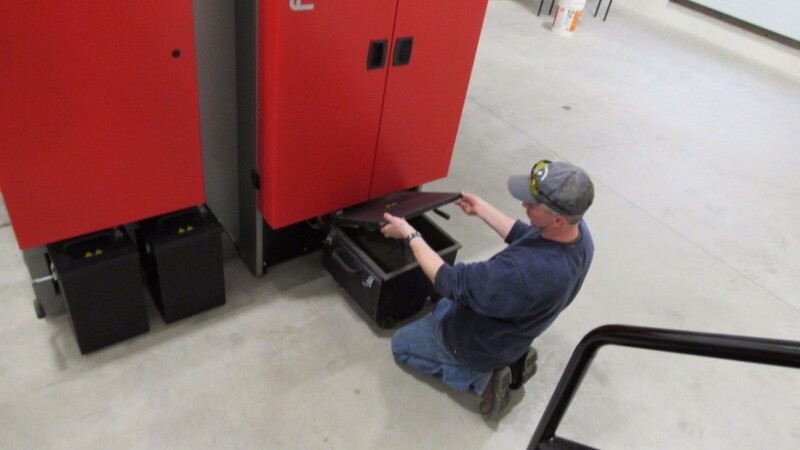 To keep costs down, it was decided to set up the second Whelen biomass system for blower truck delivery only. See the four 5" delivery pipes. Each chip storage bin has a rotary sweep extractor at the bottom of the pile. Wheeled ash containers are easy to detach and empty. This should be done about once a week in mid-winter.